More accurate than traditional cast-making methods that rely on plaster bandaging, this technology means orthotists will no longer resort to plaster when applying casts. With this technology, any body part can be scanned in both 3D and in real time. Scanned files are transferred by Internet to Ergoresearch’s computing platforms, where the data is used to manufacture custom fit medical orthotics. 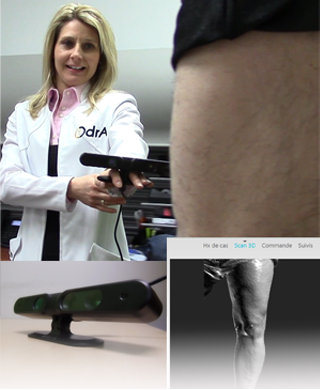 While the Company’s Web-Fit custom foot orthotics’ computer-assisted design and manufacturing system relies on a pressure distribution system, creating a knee brace requires ‘3D contoured imaging.’ In this context, a scanner is very advantageous and advances are significant. It is also a greener technology. With it we can eliminate hundreds of overland shipments, in addition, with the thousands of pounds of plaster used each year, clearly environmental benefits are important.